Skip the manual transmission. 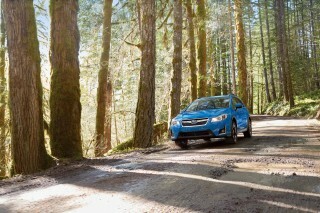 The CVT has the best handle and more power. It's our pick for enthusiasts despite being an automatic. The 2017 Nissan Juke is best considered as the sportiest pick among subcompact crossovers, but it does come at a price. The 2017 Nissan Juke has been with us for a while, but still manages to be a fresh take on a crowded subcompact crossover class. 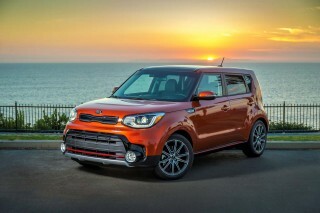 Its funky looks and style are refreshing for cars that are increasingly relegated to appliance-like duty. Starting with base S models, the Juke is offered in SV, SL, Nismo, and Nismo RS trims, with the latter trim boasting a boosted version of the bright turbo-4. For 2017, the Juke largely stands pat, although a new Black Pearl Edition model limited to just 1,250 split between the United States and Canada includes a number of special styling touches in—you guessed it—black pearl paint. The Juke trades on its style and performance, and neither let the side down. Unlike anything else on the road, the Juke is a small, tall crossover with a rally-ready face and frogeye lights that still look good to us—even entering its seventh model year on the market. The Juke is all about its curves and hips, with a coupe-like roofline that somewhat compromises rear space. Under the hood, most Juke models will be fitted with a 188-horsepower 1.6-liter turbo-4. 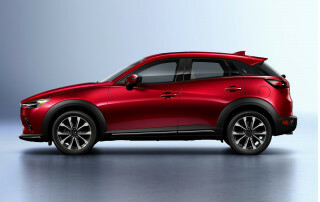 The Juke is offered in front- or all-wheel drive, with a continuously variable automatic transmission standard on most models, or a 6-speed manual transmission available in front-drive Nismo and Nismo RS models. We've found the Juke's steering to be exceptionally sharp in every model, almost as good as Nissan's sports cars. 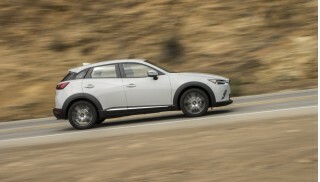 Enthusiasts may drool at the possibility of a sports crossover with a row-your-own manual transmission, but we've found the best sorted models to be all-wheel-drive versions, which include a slightly better weight distribution and independent rear suspension. Nismo models revise up to 100 parts, including a bigger rear spoiler to increase downforce and a limited slip differential for front-drive models. High-powered Nismo RS models feature a bigger boost from the turbochargers, all the way up to 215 hp, along with the Nismo's mechanical and appearance features. Considering the Juke's sporty mission, fuel economy may not live up to its billing. The EPA rates the Juke at 28 mpg city, 32 highway, 29 combined with an automatic transmission and front-drive, but we've seen real-world numbers lower than that during sporty drives. The Juke's fun exterior writes a check that it's cramped interior is apparently cashing. Compared to other crossovers, the Juke is small and less functional. Its cargo area is smaller than many sedans' trunks, and rear-seat passengers need to be on the small side—leg room and head room are relatively compromised. The interior layout is a mixed bag with funky colors and fabrics, with hard plastics and some bad textures in places. Overall, the Juke's fun unconventional approach helps us forget some of the eccentricities—but not entirely. The Juke's age starts to show in its crash-test scores, which are now relatively poor. Federal testers have given the Juke a four-star overall score with a worrying three-star score in frontal crash protection. The IIHS notes the same with their "Poor" score in their small front-overlap crash test. Nissan made standard a rearview camera, and makes available a surround-view camera system that helps improve safety, although outward visibility isn't as poor as you might expect from such a stylish car. Pricing for the base models starts at just over $21,000 for front-drive S models. 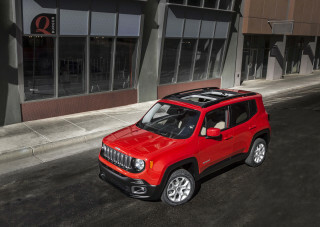 They come with 17-inch wheels, Bluetooth connectivity, keyless ignition, a rearview camera, power windows and locks, air conditioning, and 5.0-inch touchscreen for infotainment. For 2017, Nissan made standard its cold-weather package in SV and SL trims, which includes heated front seats and heated outside mirrors. Nismo and Nismo RS models add sportier buckets and contrast stitching, although there are relatively few options from the Nissan factory for the Juke. Top-of-the-line Nismo RS models with all-wheel drive and an automatic run about $31,000, including destination. The Juke doesn't look like anything else on the road, and that's exactly what some people are going for. The 2017 Nissan Juke is still fresh, even though the look is relatively aged. The Juke marries amped-up rally racer with some of the utility and styling of today's small crossovers. It's futuristic—and polarizing—and has gained a following because of its unique look. 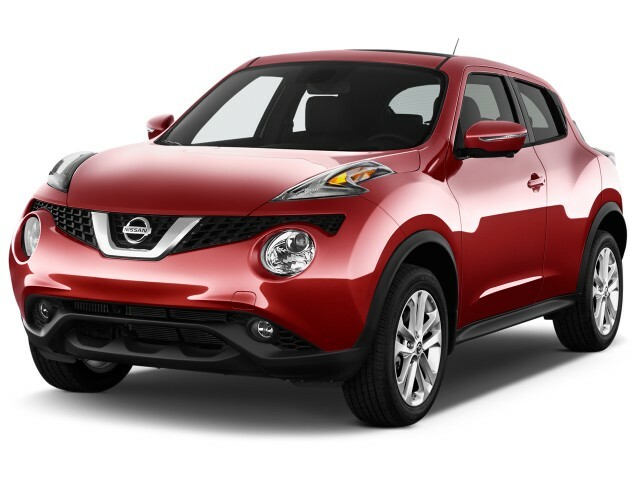 The Juke is all hips with bulges, swells, and angles around the car. The tall fenders rise from the low-mounted headlights, blade-like turn signals, and aggressive grille. The sloping roofline gives the Juke a coupe-like profile (at the rear passengers' expense) and the wide rear haunches complete the sporty exterior design with hidden rear door handles. Inside, the Juke is a mixed composition of motorcycle-inspired gauges and looks, with a changing cloth fabric for seats and colorful inserts. Its look certainly isn't ordinary, and it may not be for some peoples' tastes. Then again, that's probably what Nissan's designers were going for anyway. Nissan also offers a Juke Color Studio program that gives buyers more ways to customize their vehicles, with bright colors for the wheels, rear spoiler, door handles, headlamp trim, side sills, and fascia trim. These trims are sold individually, at the dealership, but can be included in vehicle financing. With sharp handling and a spunky turbo-4, the Juke is the "sports car" of compact crossovers. Part playful, part menacing, and part odd duck, the 2017 Nissan Juke is at its best when it's considered as a sporty subcompact with a lift. It's a stronger performer than others in its class, although the Juke isn't as mature or refined. The base engine is a 188-horsepower 1.6-liter turbo-4 that's fitted in S, SV, SL and base Nismo models. Those cars can be equipped with either front- or all-wheel drive, but a continuously variable automatic transmission is the only option for 2017. You'd think this powertrain would yield a quick little urban runabout, yet it feels oddly ponderous in traffic—and rather noisy when you do want to extract all the available performance out of the powertrain. Push it hard, however, and it is quicker than the competition, accelerating from 0 to 60 mph in about seven seconds. 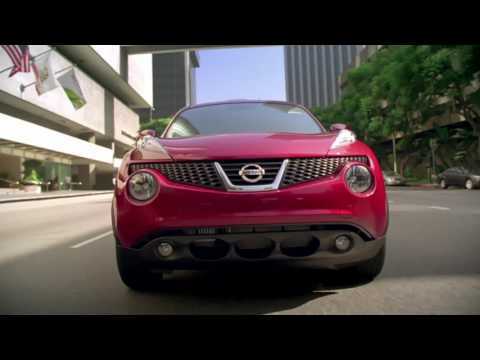 The all-wheel-drive system complements the Juke's on-road behavior more than it adds off-road capability. It's probably barely suited to a steep driveway covered in snow, and the all-wheel-drive system is best thought of as a performance option for street use, bringing with it independent rear suspension instead of the front-drive model's torsion-beam rear. 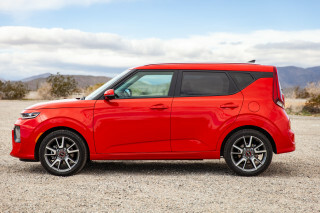 That would make it the enthusiast's choice despite the added weight, complexity, and cost—except that it means you can't get the 6-speed manual transmission at all, as it's only available in front-drive Jukes. All versions of the Juke come with adaptive steering and transmission modes designed to control the crossover's behavior. The Eco mode feels intentionally sluggish, to the degree that it interferes with smoothness (we tended to over-press the accelerator to get the desired acceleration, then had to back off, repeatedly). Normal mode is a good midpoint for drivability, while Sport mode actually feels sporty—raising the idle speed, reducing turbo lag, and sharpening the steering. But as we've noted in repeated drives of the Juke, it cuts even more into this model's already lackluster fuel economy. Juke Nismo RS models get added punch under the hood from the turbochargers, up to 215 hp and 210 pound-feet of torque (all-wheel drive models make 211 hp). Opting for the Juke Nismo models add nearly 100 other revised components, including exclusive lightweight alloy wheels, a specially tuned suspension, more downforce, and more aggressively bolstered sport seats. It's also the only way to get a 6-speed manual transmission in a Juke anymore—and it's only available with front-wheel drive. Despite the existence of a third-pedal model, we still say the all-wheel-drive version is the enthusiast's pick, especially with those models' independent rear suspension. The Juke's funky exterior and shape writes a check that the cramped interior space and packaging ends up cashing. Compared to many of the Juke's likely subcompact crossover competitors—such as the Chevy Trax, Honda HR-V, Fiat 500X, Mazda CX-3, or Subaru Crosstrek—the Nissan is the least practical of the bunch. The interior layout is a little mixed: the shiny, color-shifting seat upholstery looks a little cartoonish, but still cool; the hard plastics and buttons are unmistakably bargain basement. Altogether everything fits—just not well enough to make us forget that the Juke is built with a budget mission in mind. The Juke is best experienced from the front seats, where visibility and space is generally good. Rear-seat passengers are asked to make do with 32.1 inches of leg room, which is 3 inches less than a Subaru Crosstrek or 7 inches less than a Honda HR-V. The second row is a little taller than we think it needs to be, which eats into available head room for rear seat passengers, opt for a sunroof and that head space diminishes further. Cargo room is limited to just 10.5 cubic feet with the rear seats in place, which is less than many compact sedans. 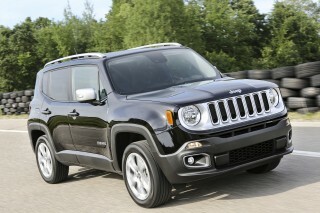 Fold down the rear seats and that space opens up to 39.5 cubic feet, which is less than many other in the class again. Time has caught up to the Juke, which is reflected in its lagging crash-test scores. The 2017 Nissan Juke is now firmly behind the set in crash-test scores, an indicator of its relatively old structure. Federal testers haven't yet finalized scores for 2017, but based on the similarities from 2016's version, we can carry over those scores this year. The Juke received a four-star overall score with a worrying (and relatively rare) three-star score for frontal crash protection. The IIHS gave the Juke top "Good" scores in most tests, except the small-overlap front crash test, where it netted another worrying "Poor" rating. Standard safety equipment includes dual front airbags, front side airbags, side-curtain airbags, anti-lock brakes, stability and traction control, a rearview camera, and tire-pressure monitors. Standard on the SL and optional on the SV is a useful (and potentially mishap-preventing) surround-view camera system. Outward visibility in the Juke is surprisingly good, despite the short side windows and thick rear pillars. Cold-weather gear is standard on SV trims and higher, but the Juke is fairly well appointed already. The 2017 Nissan Juke is offered in the same trim levels as last year, with heated seats and outside mirrors as standard equipment for SV trims and higher, which is new for this year. The Juke's trim lineup consists of S, SV, and SL models, as well as sportier Nismo and Nismo RS grades. All-wheel drive is available on all trims, however only front-drive models can be fitted with a manual transmission. Stepping up to the SV model adds a few more creature comforts, such as a leather-wrapped steering wheel, power moonroof, upgraded cloth upholstery, satellite radio, and automatic climate control. The top model in the standard Juke lineup, the SL, adds fog lamps, perforated leather upholstery, a Rockford Fosgate six-speaker audio system, and an upgraded 5.8-inch infotainment system with navigation, voice recognition, SiriusXM Traffic info, and Sirius XM Travel Link, which includes fuel prices, weather, movie listings, and stock information. Jumping up to the Nismo model adds sport bucket front seats, sportier trim pieces (a different shift knob and door panels, for instance), red contrast stitching, 18-inch wheels. The Nismo RS models top the range with four wheel vented disc brakes, a helical limited-slip differential for front-wheel-drive models, Recaro sport seats, special upholstery with leather and synthetic suede, and carbon fiber interior trim for just under $31,000 for an all-wheel-drive model. 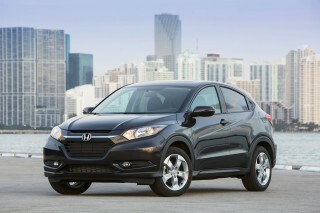 Adding all-wheel drive to any trim adds $1,850 to the bottom line. The lone factory option from Nissan is a tech package available on SV trims that adds an upgraded stereo, bigger infotainment system, and a surround-view camera system. A long list of dealer-installed options supplements the factory's bare minimum if buyers are looking to customize their cars. For 2017, Nissan offers a Black Pearl edition of the Juke, which is the latest in a string of special editions for the crossover. The Black Pearl edition adds to an SV-trimmed Juke an all-black exterior with white side mirrors, white door handles, white spoiler, and white front and rear bumper accents. According to Nissan, only 1,000 Black Pearl editions will be made, and the package adds $1,190 on top of the SV's $23,490 starting price for front-drive cars, or $25,340 for all-wheel drive. The Juke's turbo-4 isn't bad on fuel consumption, provided you can temper your right foot. The 2017 Nissan Juke manages to be fairly fuel efficient as a sporty ride, or reasonably thirsty for a tall hatchback. Your worldview dictates a lot here. Other models vary from those numbers, but not far. All-wheel-drive versions of the Juke are rated at 26/30/28 mpg or 25/29/26 mpg if you opt for the Nismo package. Jukes with a manual transmission are front-drive only, and those are rated at 27/33/29 mpg or 26/31/28 mpg with the Nismo package. In real-world driving, we've found those numbers to be somewhat optimistic, but only because we were scooting around the city with the busy little turbo-4 spooled up everywhere we went. 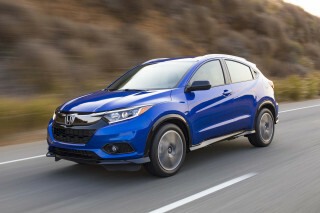 Comparatively, all-wheel-drive versions of the Honda HR-V hatchback and Subaru Crosstrek manage 29 mpg combined with an automatic transmission. Looking for a different year of the Nissan Juke?